CUPERTINO, CA (PR Buzz) – December 12, 2018 – – Physical networking can bring about big opportunities for you and your business. The people you meet when you network can help you achieve your goals if you do it right. Trust is something that you have to earn if you want people to do business with you and refer you. To be effective in networking, you need to present yourself as someone who’s authentic and can bring in value to the table. You also need to make use of the tools available to leverage the in-person meeting and networking that you’ve done. 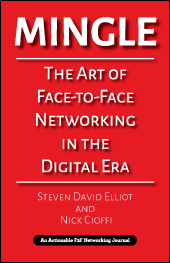 Co-Authors Steven David Elliot and Nick Cioffi of Rockstar Connect, a firm specializing in setting up, filling the room, and managing physical networking, wrote this book as a tool not just to help their meeting hosts and attendees, but all individuals who see the benefits of networking face-to-face (F2F). Through years of experimentation and implementation, they are experts at what they do and have made it easy for you to hone your skills in this area as well. This AHAbook™ comprises 140 AHAmessages™ that enlightens all business people on how physical networking can greatly help your business. There are big opportunities to be created and found if you mingle with other people. “If you want to take your business to a higher level, you need to have people supporting you. This book successfully explains why it’s true that as individuals, we may fail, but as a group, we can succeed.”says Mitchell Levy http://aha.pub/MitchellLevy, The AHA Guy Thought Leader at AHAthat™ (https://AHAthat.com). Read and share AHAmessages in this AHAbook on Twitter, Facebook, LinkedIn, and Google+ by going to http://aha.pub/Mingle. AHAthat makes it easy for you to establish your expertise, whether it's by sharing high-quality content of thought leaders from around the world (over 46k AHAmessages that you can share in seconds, for free) or by quickly creating a thought leadership book of your own. You can press the “easy button” by having us ghostwrite your book and run an Amazon Bestseller Campaign. If you want to write it yourself, you can follow a simple three-step writing process. Visit https://AHAthat.com/Author for more details. To have us help your corporation amplify its thought leadership, please contact JenileeManiti at jenilee.maniti@thinkaha.com or call (408) 257-3000.